In the previous chapter we looked at how a balance sheet was put together and the numbers that go into it. In this chapter, we are going to take all those numbers from the balance sheet and turn it into useful information for investors. A company’s balance sheet contains a wealth of information for investors. The numbers within it allow you to calculate a lot of very useful ratios which can reveal a great deal about a company’s finances and whether its shares could end up being a good investment or not. Calculating ratios – where we divide one number by another number – would take a lot of time if you were doing it by hand and wading through years of annual reports. With SharePad, all the useful calculations are already done for you. You can look at a particular trend or ratio for a company going back more than twenty years if you want to. However, when it comes to analysing the numbers in a balance sheet always remember what a balance sheet is. It is a snapshot of a company’s financial position at one point in time – usually the end of its financial year or half year. It is not uncommon for a balance sheet to change very quickly within a few months. For example, debt levels can often be a lot higher during the year than they are at the end of it. This may be because suppliers may have been paid before customers have bought any products or services. Companies tend to present their year end balance sheet when they give the most favourable view of their finances – for example, retailers report shortly after Christmas. It’s always worth bearing this in mind. Before we get on to calculating some balance sheet ratios, it’s probably a good idea to ask ourselves what you are trying to find out before we start. Any big changes in the ratios from one year to the next. Or big changes in the ratios compared with competitors. This might alert you to the fact that something significant is changing or that something is possibly wrong. The trends in the ratios over a period of time. So you will be looking for upwards, downwards or consistent trends. What has happened in the past probably won’t be repeated exactly in the future, but the more you learn about a company’s historical performance the better the investment decisions you will probably make. SharePad will focus on calculating the following types of ratios. Liquidity ratios – looking at the ability of a company to pay its liabilities when they fall due. Gearing ratios – the amount of borrowed finance as a percentage of shareholders’ or equity finance and as a percentage of all company finance (capital employed). Below you’ll see a list of all the balance sheet ratios that SharePad currently calculates. As you can see, there are a lot of them and they are all very useful. I am going to use Tesco’s balance sheet for all the ratio calculations. Let’s start by looking at liquidity ratios. Liquidity isn’t a word that most people will use or think about during their everyday lives. If you are new to investing you may even find the word rather confusing. So what does liquidity mean when we are talking about investing in companies? You might be familiar with the term asset rich and cash poor. This might be used to refer to an old aged pensioner who has lived in a house for years which has become very valuable but they don’t have a lot of income and therefore money to pay the day-to-day bills. You could say that the OAP has a liquidity problem. Companies can find themselves in a similar position. They can be profitable, have no debts and look financially sound but if they have to pay a bill before their customers pay them then they can get into financial difficulties very quickly. This is is what liquidity ratios were designed for – to spot companies that might find it difficult to pay their bills. These are the kind of companies you also might want to avoid investing in. This ratio look at a company’s current assets (assets that can be turned into cash within one year) and compares them with its current liabilities (payments that are due within one year). It is asking: Are the current assets sufficient to pay the current liabilities? Is the current ratio greater than 1? If not, then the company may have a liquidity problem and could be heading for trouble. Normally, a current ratio below 1 does spell trouble ahead. However, Tesco is a good example as to why such a conclusion might not always be the right one. 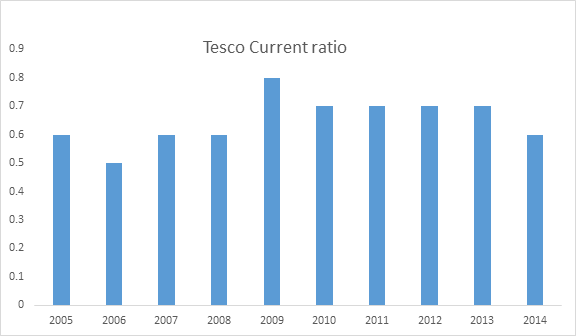 As you can see from the table above, Tesco’s current ratio is a lot less than 1. It was 0.78 in the last financial year – and has consistently been so for years. Is this a sign that Tesco is heading for financial trouble? In a word, no. I will explain why shortly. When you are calculating any ratio, it is important to try and understand the potential drawbacks of it. The current ratio has a few that are worth mentioning. Stock is in the current asset number and is assumed that this can be turned into cash within one year. This might not be true. Some of it could take a lot longer to sell depending on the type of goods involved. For example, a product that goes out of fashion could be very difficult to sell, and its price might have to be slashed in order to turn it into cash. Bank overdrafts are in current liabilities and whilst they are effectively repayable whenever the bank demands, in practice they can roll on for years. The current ratio ignores the timing of when things get turned into cash and when payments are due. For example, current assets could be much greater than current liabilities but all the liabilities could be due now and all the assets can’t be turned into cash for almost a year. I’ll show you a way to deal with this shortly. So a current ratio can be useful but must be treated with caution. You’ll have to dig deeper than this to really get to grips with a company’s liquidity. To get round the problem of stock being turned into cash, the quick ratio modifies the current ratio slightly. Quick ratio = (current assets – stock)/current liabilities. As with the current ratio, if the number is less than 1 – as it is for Tesco – it may not be a sign of trouble, it all depends on the type of business you are looking at. This is very similar to the current ratio, except current liabilities are taken away from current assets rather than being divided into them. But what do we mean by working capital? Working capital is the money that a company needs to operate on a day-to-day basis. Some companies need more of it than others. That’s because they might need to hold lots of stock, pay for things in advance and sell goods to customers on credit. All this can be a drain on a company’s cash resources, so it might need to invest cash in the business so that it can pay its daily running costs. This cash is known as working capital. As you can see, Tesco in 2014 had a negative working capital balance to the tune of minus £5.8bn on its balance sheet date. This is the extent to which its current liabilities exceed its current assets. The current ratio above suggests this is a sign of possible trouble. 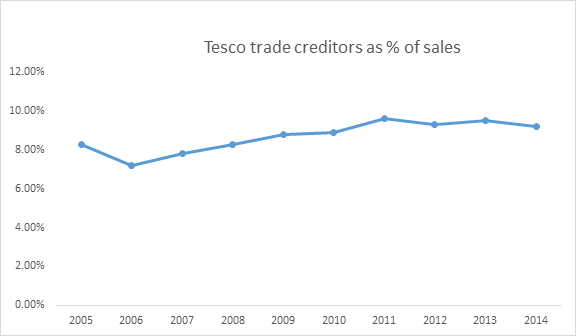 So why has Tesco been able to exist with finances like this for years? In a bizarre way, a current ratio less than 1 and negative working capital might be a sign of strength. That’s because Tesco doesn’t need to invest extra cash to finance some of its day-to-day expenses. It relies on somebody else to do this instead. 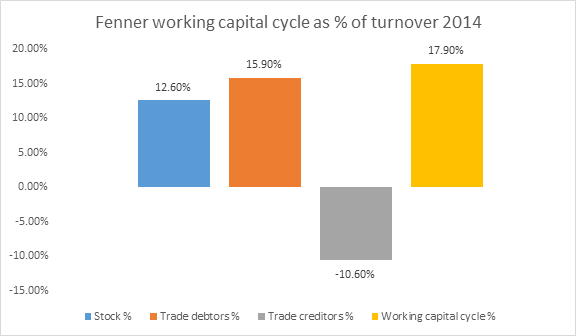 To explain why we are going to look at something known as the working capital cycle. This shows how quickly a company is selling its stock. The slight problem here is that companies include different expenses in their cost of sales figures or sometimes don’t disclose it. In this case, turnover can be substituted for cost of sales. This is what I will do in the case of Tesco. Alternatively you can ignore the adjustment into days and just calculate stocks as a percentage of turnover. In Tesco’s case in 2014, this was 5.6% which should be seen as a low number. This was unchanged from the year before but slightly higher than it was a few years previously. Supermarkets will be able to turn stocks of food and drink into cash very quickly. A whisky distiller whose stocks have to mature in casks for years would obviously take a very long time to do so. One thing to bear in mind here is that calculations such as stock days will never be entirely accurate. That’s because we are comparing a number at one point in time (stock) with a number based on something throughout a year (cost of sales or turnover). The same points apply to debtor days and creditor days. Again, it is probably easier to look at debtors as a percentage of turnover. The lower the number the better. In 2014, this was 3.4% for Tesco. Supermarkets don’t tend to make sales on credit but may have other activities where they do. The overall proportion of sales on credit should be very low. A business selling furniture on the other hand might sell a large proportion of its products on credit. Sometimes, companies don’t disclose trade debtors in their annual accounts. If that’s the case then SharePad won’t give you the trade debtors as a percentage of sales ratio. Instead it will give you the total debtors as a percentage of sales ratio. This is not quite the same but can give you a flavour of what’s going on in a company. This ratio shows how long on average a company takes to pay its suppliers. 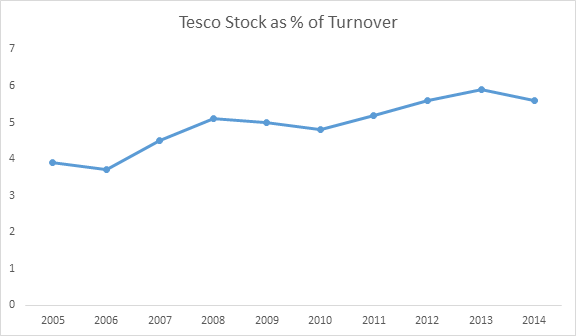 Again, I have used turnover instead of cost of sales for Tesco in 2014. 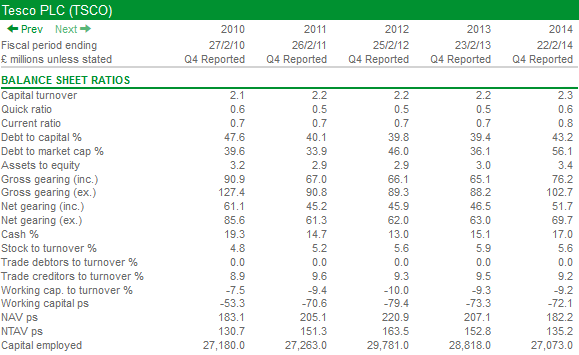 Alternatively, you can see that trade creditors were 9.2% of turnover. This is the number that SharePad will give you. Some companies try to wait as long as possible before they pay their suppliers. This doesn’t always lead to a harmonious business relationship and can cause the supplier a lot of financial hardship. What a long creditor days is effectively showing is how a supplier is effectively financing the customer’s business. This supplier financing means that a company produces generates more cash than if it had paid its suppliers earlier. One question you should probably ask yourself is this: Can this situation continue in the future? If suppliers demand better treatment and want paying earlier then Tesco’s will not be able to produce as much cash and will need more working capital to operate day-to day and its borrowing levels will go up. If we add all the three ratios together we can calculate the speed of cash around the working capital cycle. Tesco was able to turn its sell its stock and collect its debtors before it had to pay its suppliers. This is a nice position to be in for Tesco but not very nice for the suppliers. Tesco therefore doesn’t look as it has a liquidity problem at all. A supplier to it might have though. If it is having to wait 33.5 days to get paid it is going to have to make sure it extends its payments terms for as long as it can or else it might find itself short of cash when it needs to settle some of its bills. Gearing, like liquidity, is an unusual word if you aren’t familiar with financial terms.Gearing is a very important term to understand. However, gearing in finance is very similar to gearing on a bike or a car. If you can think of it in those terms it will help you understand what it means for a company. When you ride your bike in a higher gear it travels further for each complete turn of the pedals. The same is true for financial gearing. The more debt you finance the business with the bigger the percentage change in shareholders’ profits for each percentage change in sales. This can be a good and bad thing depending on which direction sales are heading. The bottom line is that gearing increases the risk for shareholders. The American term for gearing is leverage. This word is becoming used more often in finance books and the financial media. Let me show you how gearing increases risk for shareholders with a few simple examples. We’ll look at how gearing effects shareholders’ income first. Below is an income statement for a company with no debt. All its operating costs are variable (this means they change in exactly the same proportion to changes in sales). In this case, the change in profits for shareholders is exactly the same as the change in sales. Now add some debt into the business with an annual interest bill of £5m. The introduction of gearing (debt) means that a 10% change in sales leads to a 13.3% change in the profits for shareholders. The gearing has magnified the change in sales on shareholder profits just like putting a bike or car up a gear. With even more debt (costing £10m a year) the gearing effect gets even bigger. Here a 10% change in sales leads to a 20% change in profits. People often ignore gearing when times are good and sales and profits are growing strongly. They sober up very quickly when sales are falling though. Gearing applies equally to asset values. The best way to explain this is through the simple example of a house – one with a mortgage, one without. With no mortgage, the change in the value of the house feeds through to same percentage change in net asset value or the householder’s net worth. Now look what happens when the householder takes out a 95% loan to value mortgage. A 10% increase in house prices increases the net asset value by a whopping 200%. A 10% fall wipes the householder’s wealth out completely. This unfortunate plight has been experienced by quite a few households when house prices have crashed and is called negative equity. The same can happen with companies. Britain’s banks were financed in a very similar way to a 95% mortgage (in fact worse) just before the financial crisis hit. This looks at the amount of equity (the amount of money invested in the business by shareholders) that is financing a company’s total assets. The bigger the amount of assets that are financed by equity the lower a company’s gearing ratio. Think back to the previous example of the £100,000 house that was financed with a £95,000 mortgage and £5,000 of equity. Here assets to equity was 20 times (£100,000/£5,000). Put another way, this means that £1 of equity was supporting £20 of assets. As we saw earlier, there’s not much protection for the equity when asset values fall when gearing is this high. 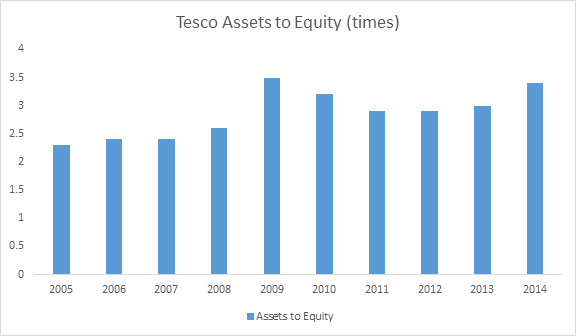 For Tesco in 2014, its assets to equity ratio was 3.4 times (50,164/14,722) indicating that it was not excessively geared. However, you need to compare this to the company’s history and its competitors. 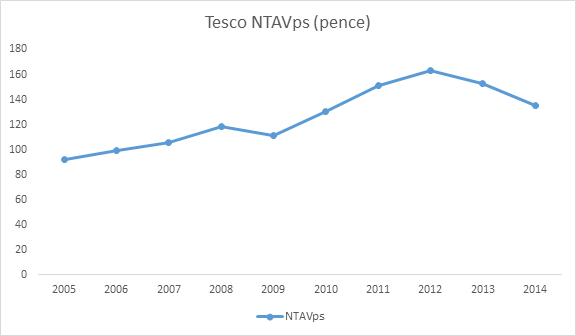 A look at the chart below shows that Tesco’s gearing on this measure has been increasing in recent years. Some companies are much more highly geared than others. Banks for example may have an assets to equity ratio of 20 times. Before the the financial crisis it was typically over 40 times and was one of the reasons their finances came under severe strain which saw shareholders lose a lot of money. This ratio looks at total borrowings as a percentage of shareholders’ equity. The higher the ratio, the bigger the gearing and possibly the bigger the risk to shareholders. For Tesco in 2014, its gross gearing was 76.2%. Put another way, you can say that Tesco has 76.2 pence of debt for every £1 of equity. You might have noticed that SharePad has two measures of gross gearing with the letters “inc” and “exc” after them. This shows whether intangible assets such as goodwill, brands and patents are included in the equity figure. Some people believe that these intangible assets are not easy to quantify and might not be realisable if the company was wound up. Whether they are or not needs to be investigated on a company by company basis but we have included both measures. Excluding intangible assets (we take the value of these away from total equity) will increase the measure of gearing. Tesco’s increases to 102.7%. Net borrowings (or net debt) are defined as total borrowings less cash. This is the measure of borrowings most commonly used by companies and commentators when talking about issues such as indebtedness and gearing. Tesco’s net gearing in 2014 was 59.2%. This is why net debt and net gearing do need to be treated with some caution. Taking away the cash from borrowings may not be prudent as the cash is not surplus cash and cannot be paid out to shareholders as it may have to be used to pay outstanding bills. For this reason, using gross gearing rather than net gearing may be more sensible. The other thing to be aware of it what is known as off balance sheet debt. Some companies choose to rent rather than own assets. Examples would be stores for retailers, machinery or rolling stock for train companies. These assets do not go on a company’s balance sheet but the company is often tied into long term rental agreements and can be considered a form of off-balance sheet debt. These rental payments can mount up to be substantial costs for a company and understate its gearing or leverage. Thankfully SharePad deals with this by calculating a ratio known as fixed charge cover which will be discussed in a later chapter on analysing income statements. The financial crisis of 2008 taught many investors some valuable lessons. Not only did it tell them that too much debt was very dangerous but also that the timing of when that debt needed to be paid back was something they needed to know about too. Lots of companies borrow money which needs to be paid back at different times. These are known as debt maturities. More often than not, borrowings are repaid by taking out another loan. But what happens if the financial markets are in meltdown? The company might not be able to get another loan. If it can, then it may have to pay a much higher interest rate than it was previously which will lower its profits in the future. SharePad allows you to analyse a company’s borrowings and see when they are due to repaid. You can see if there are any large repayments due soon or whether most of its borrowings are due a long time into the future. Below are Tesco’s borrowings split between its short term (less than 1 year) and longer term (greater than 1 year). As you can see, most of its borrowings are due after one year, although finding £1.9bn to repay within a year is a sizeable amount it should not be too difficult in normal markets. As well as calculating ratios, there are other useful bits of information that you can glean from a company’s balance sheet. They can be very useful in helping you to understand the value of a company’s shares and to calculate other ratios. We know that net asset value (or NAV for short) is a company’s total assets less its total liabilities. It also equals the amount of shareholders’ equity in a business. NAV can be a useful measure for companies that have lots of assets such as property companies, house builders or financial companies. In some circumstances it is used as an estimate of what the company could be worth if it was liquidated and the proceeds returned to shareholders. It is very easy to calculate and SharePad does this for you. For Tesco in 2014 this was 182.2p per share. One of the problems with NAV as we noted above is that it often contains a lot of intangible assets where the value might be questionable. To get round this, it is possible to calculate a different version of NAV based on a company’s tangible assets – net tangible asset value per share (NTAV ps). For Tesco in 2014 this was 135.2p per share. We’ll talk more about these measures when discussing how to weigh up the value of a share in a later chapter. But if you can find a share where its share price is less than its NTAVps you might want to do a bit more research and find out if it could be a potential bargain. Is a term used to describe the amount of money that has been invested in an entire business. It is a very important number. As we shall see in a later chapter on investment returns, the sign of a good company is a high return on the money it has invested. Capital employed can be defined in many different ways, but you can calculate it either from the asset side or financing side of a balance sheet. To give you an idea of how SharePad does this consider a house with a mortgage again. £100,000 – the price of the house – from the asset side. All you really need to understand is that capital employed represents the money that a company has invested in its business. You don’t need to understand how it is calculated as SharePad will do this for you. It is a very important number used to calculate what is arguably the best measure of company performance – return on capital employed (ROCE). The calculation of Tesco’s capital employed for 2014 is shown in the table below if you are interested in seeing how SharePad calculates the number. If you want to understand how Tesco’s capital employed of just over £27bn in 2014 was calculated, it is described in the box below. If you wanted to be more conservative, you could ignore cash on both the asset and financing sides. Both sides would still balance. There will be a lot more on how to use the capital employed number in Chapter 8. This is how SharePad has calculated Tesco’s 2014 capital employed of £27,073m. As you can see, both the asset side (in the top half of the table) and the financing side (in the bottom half) give the same value. From the asset side, capital employed is total assets less non-interest-bearing current liabilities less cash and securities. What we are doing is taking the assets used in the business and subtracting current liabilities such as unpaid bills. We take these away as these are a form of free financing for a business. We don’t take away short-term borrowings as they are financing the assets and we don’t want to count them twice. From the financing side, we take total equity, then add non-current liabilities such as debts, pension fund deficits and provisions for future expenses, add short-term borrowings and take away cash.